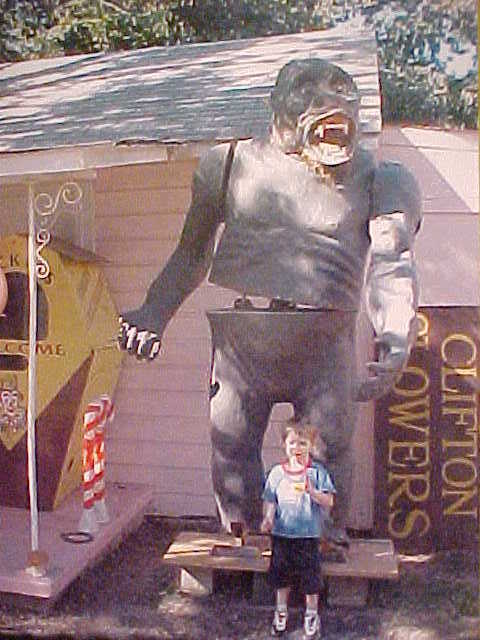 I recently received an email from a visitor who owns a gorilla exactly like the one used at Lagoon’s Haunted Shack and Terroride. His gorilla came from an auction of items from War Memorial Amusement Park in Arkansas. If possible, we’d like to find out at least who manufactured these gorillas. Here’s his description of the mechanical creature. Lagoon’s gorilla (nicknamed George by employees) was first part of the Haunted Shack and later used in Terroride. He was removed some time after 2007 and became a part of the Psycho Dave’s Junkyard walk-through during Frightmares until 2011. He popped up again in the Pioneer Village Scare Zone from 2014-16 and was placed in Dracula’s Castle in 2017. If you know about the manufacturer of these gorillas or have any helpful information, please comment below or contact me and I will pass the information along. UPDATE: The manufacturer has been discovered! 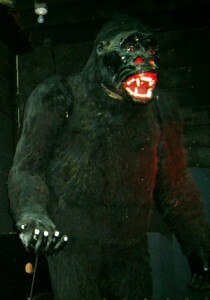 Haunted Shack Gorilla. Email messages to author from John C., 25 & 26 Feb 2011. Frightmares- Gorillas & stuff. LagoonIsFun.com Forums, 8 Mar 2011.
removed but, he has so much detail under that fur that he dosen't really need it His head moves from side to side and both arms raise and lower independently - he also rocks side to side at his hip. All that action is produced by one strong and slow geared electric motor. He stands about 100 inches tall (well over 8 feet) and was covered with the worst condition fake fur so it was removed, but he has so much detail under that fur that he doesn't really need it anyway.